Written by Dr. Anil Philip and medically reviewed by iCliniq medical review team. In a mercurial and a fast moving life in contemporary world, novel and permuted diseases strike human beings at an equally fast pace.The only indicative remedy advised by physicians is to change or slow down one's lifestyle. The old saying becomes relevent "prevention is better than cure". In this bulletin, diabetes mellitus (type 2) has been elaborated, as the disease is fast affecting our younger generation. Maintain ideal body weight, BMI (Body Mass Index), as obesity can trigger the disease. Avoid sedentary habits, like two hours or more of TV watching, internet, gaming, sitting during job, habitual laziness which increases the risk by 20%. Increase physical activity like brisk walking,using stairs, light stretching exercises, skipping, jogging, cycling, swimming as suitable to the individual. Restrict diet rich in carbohydrates which increases risk by 30%. Consume whole grain cereals which contain bran and fibre which leads to slower increase in blood sugar, hence lower insulin and glycemic index. This leads to less stress on the insulin producing mechanism thus preventing type 2 diabetes. Prefer coarsely ground whole wheat flour (chakki atta) and parboiled rice(the browner the better). Avoid or limit finely ground wheat flour, maida, raw white rice, fried potatoes, tapioca etc. Limit the intake of junk food, noodles, pasta, biscuits, pastries, cakes, sweatmeats, candies, softdrinks, fruit juices. All these contain excess sugar which contributes to high level of triglycerides, increased cholesterol thus increasing insulin resistance contributing to the risk of diabetes. Choice of good polyunsaturated fats from vegetable oils, nuts and seeds can help ward off type 2 diabetes. Seasonal fruits should be consumed whole. Avoid red meat, while swapping to healthier proteins like legumes, soya, low fat dairy, poultry and fish can reduce risk upto 35%. 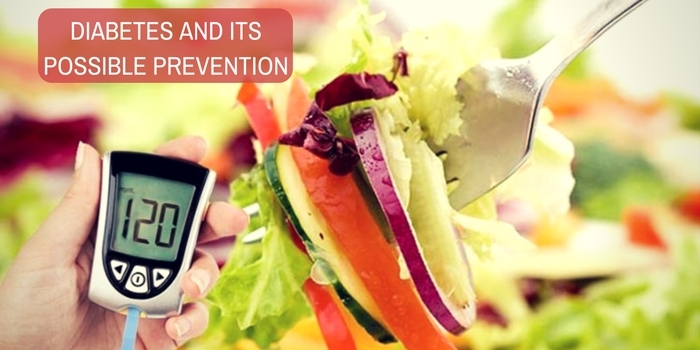 Prediabetes is a condition which signals the possibility of the disease. Do you have a question on Diabetes or Exercises?